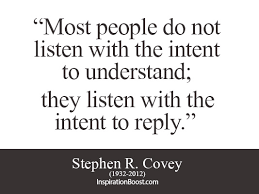 How well do you listen to the person who is talking to you? Do you really hear them or does your mind wander during the conversation? This is very common, especially when listening to people that we are close to. You may think that this is untrue, but in reality we listen and relate what is being said in comparison to our own experience and in doing so, we aren’t completely present. We become busy with our own experiences. It is a wonderful feeling to have someone listen to you completely, not only hear your words, but hear the message that you are relaying, and understand you, through your perspective. Giving this gift to others gives us this same wonderful feeling. When you sit down with your significant other, your friend, your family member, take five minutes to really listen. You will be surprised at what you have missed until now, what messages are being relayed, what feelings really exist beneath the surface. Give someone the gift of listening today!